This GE top-freezer refrigerator is designed with the freezer on top and the fresh food compartment in the lower portion. It features up front control panels along with vegetable crispers and two full-width glass shelves. There's more than enough room to fit all of your food with the generous storage capacity of this 16 cu. ft. top-freezer refrigerator. You'll find plenty of places to store everything with a full-width crisper bin, gallon door bins, compartments and shelves that fit your needs. Easily change temperature settings without having to reach to the back of the refrigerator, thanks to up-front temperature control. Plus, you'll save energy and money with our lowest-energy-consuming refrigerator ever. Amana 30-inch W 18 cu.ft. 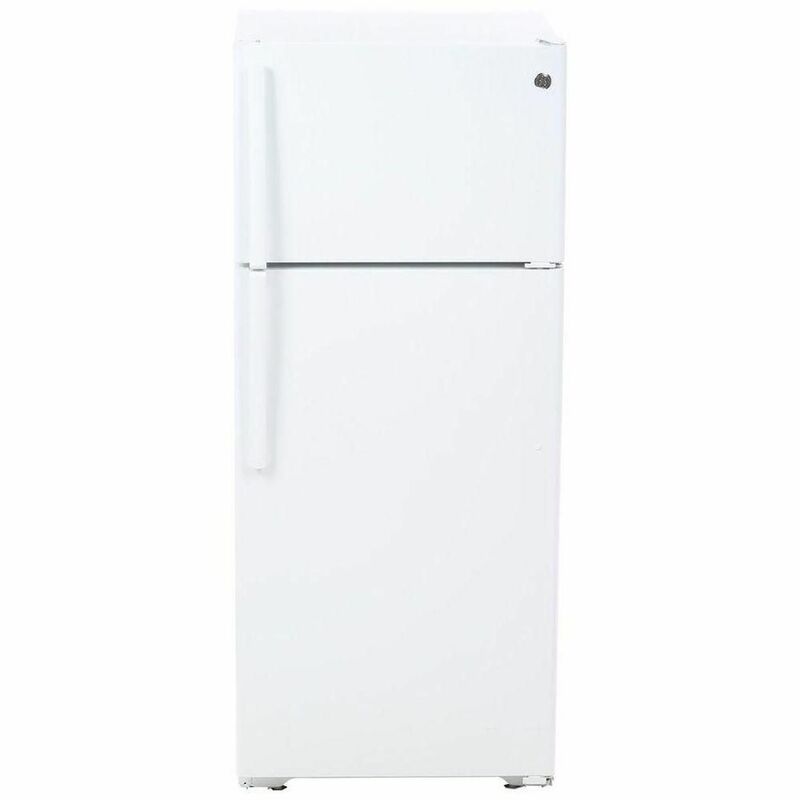 Top-Freezer Refrigerator in White. This 30-inch wide Amana. refrigerator gives you flexibility to store all your tall and oversized favorites with Flip-up Storage, Gallon Door Storage Bins and Humidity-Controlled Crispers. Plus, Glass Shelves are designed to help make cleanup easy so there's no need to cry over spilled milk. Your GE 11.6 cu. ft. Refrigerator in Stainless Steel has adjustable glass shelves in the fresh food section. With a color matched Recessed handle and reversible door swing, it gives you the look you want. An optional ice kit (IM4D sold separately) will provide additional ice. GE appliances provide up-to-date technology and exceptional quality to simplify the way you live. With a timeless appearance, this family of appliances is ideal for your family. And, coming from one of the most trusted names in America, you know that this entire selection of appliances is as advanced as it is practical. This Magic Chef 9.9 cu. ft. top freezer refrigerator has the storage options you're looking for, if you simply want a little extra fridge space in your home or office. Door bins conveniently keep beverage cans and bottles stored on the door, and glass shelves and a crisper in the fresh food section makes this refrigerator easy to organize. 28" 17.5 cu. ft. top Freezer Refrigerator in White This GE top-freezer refrigerator is designed with the freezer on top and the fresh food compartment in the lower portion. It features up front control panels along with vegetable crispers and two full-width glass shelves. 28" 17.5 cu. ft. top Freezer Refrigerator in White is rated 4.3 out of 5 by 1911. Rated 4 out of 5 by Satisfied from I received this this yesterday as a replacement for a 25 year old fridge in my shop building. Del... I received this this yesterday as a replacement for a 25 year old fridge in my shop building. Delivery was on time and product arrived undamaged. Knowing I wanted the door swing changed I had the delivery guys just set the unit down. Changing the door swing and leveling the fridge took no more than 45 minutes and was easy to do. Plugged it in and turned it on around noon. By 4pm it was cool and cycling normally. Some reviews have commented on the noise but even sitting on a concrete slab this unit is just as quiet as the old one I was replacing. So far very happy with the purchase. Rated 5 out of 5 by BigA from Quiet running. That was the main purpose in replacing our existing refrigerator. I also prefer ... Quiet running. That was the main purpose in replacing our existing refrigerator. I also prefer GE appliances to any other brand. They seem to last much longer than any other we have tried. The room inside both sections suit our needs perfectly. The outside appearance is very pleasing. Do not care for stainless steel or white. Rated 2 out of 5 by needcold from Refridgerator Noisy operation; would return if I could but bought online. Rated 5 out of 5 by Scotty313 from Features and quality is great. The product that I've received is a great bargain with great quality from GE. It was more than I expected from GE and I am ever so grateful with your product. Thank you. Rated 2 out of 5 by Dan from This refrigerator is well built but incredibly loud. The compressor runs nearly continuously and ... This refrigerator is well built but incredibly loud. The compressor runs nearly continuously and I can hear it from the other end of my apartment. It would probably be fine in a garage or basement but I would definitely not buy it for the kitchen. I ended up returning it for a comparable but quieter Whirlpool model. Rated 5 out of 5 by Bmgriffi from Quiet Refrigerator We received our refrigerator yesterday and we noticed how quiet the refrigerator is when running.